As you are all well aware by now, Nazareth are a Scottish hard rock band that had several hits in the UK in the early 1970s. Establishing an international audience with their 1975 album Hair of the Dog, their best-known hit single a cover of the ballad 'Love Hurts' in the same year, the powerhaus band continues to record and tour today. Indeed, they have just released their brand new 2011 CD, Big Dogz. Produced by guitar player Jimmy Murrison and sound wizard Yann Rouiller, the album’s production avoids the trappings of traditional polish in an effort to capture the challenging edge of classic rock’n’roll. 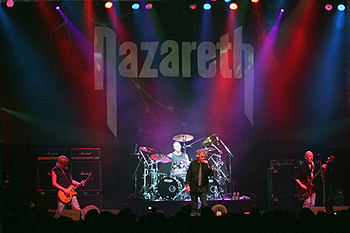 Nazareth has invested their time in finding the original sound and spirit of the ’70s, when rock bands expressed values and ideas only through their instruments, an amp and a mic. 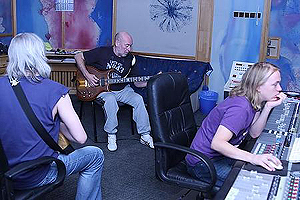 To this end, they’ve completed an album with nearly no overdubs or multiple takes, no vocal lines or solos adjusted through a computer. Exclusive Magazine recently sat down with both Jimmy Murrison and Lee Agnew and discussed their brand new CD, the early days, classic Nazareth albums, and, of course, ... Penguins! Taking it from the top and Nazareth started at different times for you both - as it was 1994 for you Jimmy, and 1999 for you Lee, please explain where you were in life before the offer came to join the powerhouse band? Lee: "We were struggling musicians!" Jimmy: "Ha ha. Yeah, I suppose we were." Lee: "If you’re going to do music for a living there are always going to be times when you can’t afford to be too choosy." Jimmy: "But when you are younger you just want to get out and play. You’ll do anything!" Lee: "That’s how you learn. Get out and do some gigs." Jimmy: "We both played in various local bands. Sometimes together, sometimes not." Lee: "Pubs, clubs, bar bands, weddings, dinner dances ... let's Rock!" Jimmy: "There was the odd bit of recording here and there." Lee: "I was quite involved in Folk music for a few years. That was good fun. Playing in other countries . First gig I ever did outside of Scotland was with a guy called Dougie MacClean. In New York! Didn’t go to bed for three days!" Jimmy: "I was already playing in Nazareth when he was a folky!" Lee: "Och Aye. And we’ve both done a bit of teaching over the years." Being the band has had various line-ups throughout the years, what makes todays four-piece more stable than any that have gone before it? Lee: "It’s the calming, zen like influence that I bring." Jimmy: "Yes, thanks for that!" Jimmy: "These days bands have to do a lot of live work in order to pay the bills. This can be quite hard at times, so it really helps to be with people who get along with each other. Who don’t wind each other up ... too much!" Lee: "You could be the greatest musician, but if you don’t get along with people ..."
Jimmy: "Or you could be an ok musician that does ..."
Lee: "You trying to tell me something?!" Jimmy: "See. It’s all about communication!" Indeed, you Jimmy came on board first for the Boogaloo album, but some fifteen years later do you wish you'd been involved in such classics as Razamanaz and Hair of the Dog! Jimmy: "Those were classics that I grew up with. But to say “I wish I was involved” would be pure fantasy. Like saying I wish I’d been on Paranoid or Smoke on the Water." Lee: "I am the Walrus." I understand ... OK, Lee you have been playing alongside your father, Pete for a while now, himself an original band member from back in 1968! Growing up, what was his go-to story of Nazareth that he always sat you on his knee and told you at night? Lee: "He was always too blasted on booze and drugs for that kind of thing. Kidding! To be honest, there were lots of little stories about the band. But I didn’t get to hear the really good ones until I was older ... if you know what I mean!" Jimmy: "Yeah. Just before you go to sleep son, let me tell you about the last time I saw Steven Tyler!" Lee: "Ha ha ha. A whole new take on Muffin the Mule!" The brand new 2011 album, Big Dogz is now upon us and it was actually produced by you, Jimmy! It's been said that the new albums production "avoids the trappings of traditional polish in an effort to capture the challenging edge of classic rock 'n roll" - sounds like quite an undertaking, so just how was that achieved? Jimmy: "Essentially, we didn’t “fix” everything. We didn’t do lots of overdubs. The idea was to let the songs breathe. To try and get a good, bare bones take of a track and work from there. If the vibe was good we just left it alone. The mix was done in Logic pro but the music was recorded to tape ... old tape that had been well used, which adds some warmth and character to the sound. We had very clever people on hand to sort out recording to tape and send that tape source to digital in real time because there is a delay between the two." Lee: "NASA stuff if you ask me!" Jimmy: "And you would have to stop recording and change the tape when you ran out of space. A real novelty!" And, with many songs completed for the album in one take, no vocal lines or solos adjusted through a computer, which one track stands out to you to be your own personal go-to song for perfection ... and why? Jimmy: "I don’t know about perfection, but I really like 'Time and Tide.' It turned out just the way I’d imagined it. Can’t say fairer than that. 'Claimed' is another one I like a lot." Lee: "I’m liking 'When Jesus Comes To Save The World Again.' Sounds like it could have come from anytime in the bands history. And it’s a good showcase for all the different stuff Dan can do with his voice." Jimmy: "Ah yes. The whisky soaked vocals of highland ‘rock warrior’ Dan McCafferty!" Indeed, the album seems to lyrically feature a lot of personal memories, roads musically trodden yourselves, so to speak - is that a fair assumption of some of the tracks? Lee: "Yeah. I think so. The songs are about all kinds of things. The thing is, when you’ve got a singer in his 60’s, I personally feel it sounds a bit weird if he’s singing about drinking, fighting and chasing girls all the time. Don’t get me wrong, there are plenty of songs in this vain that I love to rock out to ... AC/DC spring to mind! But I like the way Dan has brought a lot of emotion and honesty to this albums lyrics. Maybe I’m just getting old!" Jimmy: "You are. What about songs about smoking pot?" Lee: "I had a good one ... but I’ve forgotten it!" The one track I love is 'The Toast' which begins (and ends) with a British voice making a toast and then asking us to leave; and then ordering a taxi for Mr. McCafferty! So, whose voice is that and are you aware that the opening bars (no pun intended!) sound just like classic Status Quo?! Jimmy: "We love The Quo!" Lee: "It’s hard for any self respecting British rock fan to hear that kind of rhythm and not 'do a Quo'!" Jimmy: "'The Toast' is a fun track and if it reminds you of Quo then that’s all the better." Lee: "It’s the voice of Alan Cottam. He’s our agent. He’s from a town in England called Blackburn, where they all sound like that." Jimmy: "And we just love his accent." Lee: "'Where there’s muck there’s brass'! That’s how he talks. God, I love that!" You seem to carry around the phrase 'Nazhounds' - please explain exactly who, or what these "beasts" are?! Lee: "Nazhounds is just something Pete said in the albums press release. 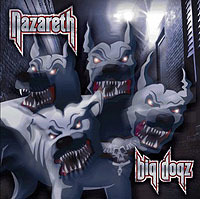 With the album being called Big Dogz he was doing a bit of wordplay with the whole ‘Dog’ thing." Jimmy: "Nazhounds does have a nice ring to it though!" Lee: A “Nazhound is a big scary looking thing that makes a lot of noise but really just wants a good feed. And it’s belly rubbed until it falls asleep!" Boyz, do you have any tattoos and, if so, and as we're not called Exclusive Magazine for nothing, which is your latest and where is it located?! Lee: "I’m almost embarrassed to say I’ve not got a tattoo! Found my first grey pubic hair the other day though! There’s an exclusive for you!" Jimmy: "What a scoop! I’ve not got any. Tattoo’s that is!" Who is the most famous person in your cell phone today? Jimmy: "Pete. Dan won’t give me his number!" Lee: "Nigel Glockler from Saxon. How cool is that?! Oh, and Cuba Gooding Jnr. He only communicates by MMS. So it might just be someone f**king with me!" Lastly, and throwing you a journalistic curve ball, Exclusive Magazine love penguins ... do you, perhaps? Lee: "Do you have Penguin biscuits in the US? Jimmy: "He means cookies. We call them biscuits." Russell Trunk "Still no, sorry!" Lee: "Whatever. Delicious with a cup of tea." Jimmy: "Best make that coffee ... but, real Penguins are very cute, but they don’t smell so great!" Lee: "That’s true. But on the whole, we love Penguins too."